Wanna know what your new family favorite recipe is going to be? Not only to make, but to eat too! This chili cooks all in the same pot…and if you toss in some chopped up carrots and/or spinach, it could be a complete meal in the one-dish. Talk about a winner! In a Dutch oven or large saucepan, brown the ground beef with the chopped onion and garlic powder. Drain and return to the pot. Stir in the black beans and undrained diced tomatoes, plus the chili powder and ground cumin. Bring to bubbling over medium high heat. Once bubbling, stir in the chicken or beef stock and the pasta noodles. Cover and cook over medium high heat for 8 minutes. Check and stir it one time as the pasta is cooking, as you don’t want the pasta to stick to the bottom of the pot. Once the pasta is al dente (after about 8 minutes), remove from heat and serve warm. 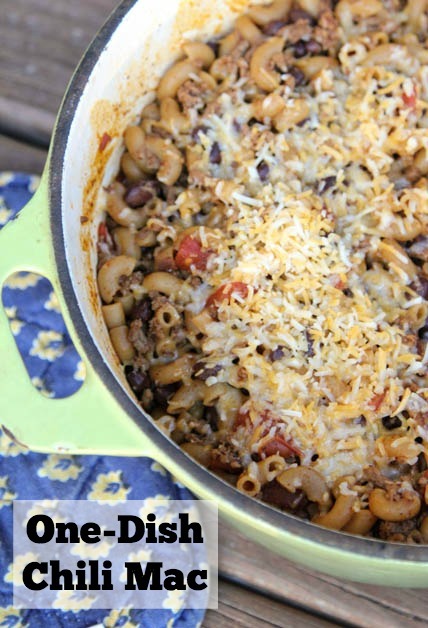 Top with shredded cheese in each bowl or over the Chili Mac in the pot. Erin, can you freeze this?